Since Joe’s passing in 2007, The Syndicate has been at the forefront of keeping his music alive. It is essentially a continuation of Joe’s last band, The Zawinul Syndicate, which at the time was fielding arguably its strongest lineup in its 20-year history. Four members of that group decided to carry on: Drummer Paco Sery, percussionist/vocalist Aziz Sahmaoui, percussionist Jorge Bezerra, and guitarist Alegre Corrêa, who has since been replaced by Munir Hossn. They were joined by Aloune Wade on bass, Emile Parisien on sax, and Thierry Eliez on keyboards. Sabine Kabongo, vocalist in The Zawinul Syndicate, frequently performs with the band as well. Among the highlights this past year, The Syndicate performed at Joe Zawinul Day in Vienna, a grand celebration of Joe’s music; and at the Blue Note in Tokyo on the occasion of Joe’s 80th birthday. 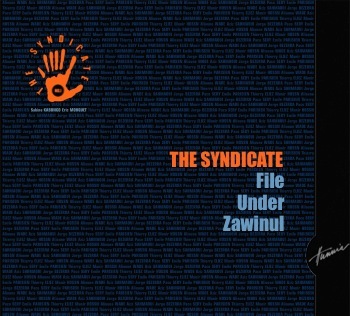 In May, The Syndicate released its first album, File Under Zawinul, which consists of all Zawinul compositions. For those of us in the states, it can be ordered from Pierre Tassone’s Music By Mail. Remarkably, it hit number one on the Hungarian pop chart. Those Hungarians have good taste! The band has three performances coming next month in Munich, Vienna and Klagenfurt (Austria.) They’re also booked in France and Zurich in May, with more to come. I don’t know who is the driving force behind keeping The Syndicate together, but I suspect that a large share of the credit goes to Risa Zincke, Joe’s long-time manager. Regardless, we’re lucky to have them. The Syndicate’s official website is www.no1syndicate.com. Basitours is the European booking agent, and a good place to look for upcoming concerts. This entry was posted on Sunday, November 25th, 2012 at 7:54 pm and is filed under News. You can follow any responses to this entry through the RSS 2.0 feed. You can leave a response, or trackback from your own site.